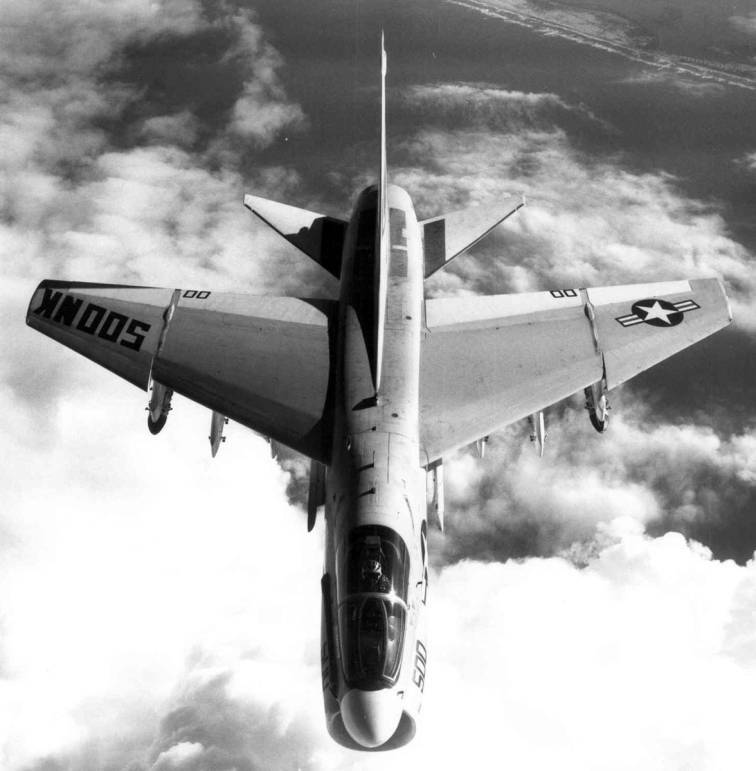 The Warhawks of VA-97 were commissioned on June 1, 1967 and assigned to Carrier Air Wing 14 (CVW 14). On May 28, 1968, they departed San Diego embarked on USS Constellation (CV-64) for the squadron’s first WESTPAC deployment. 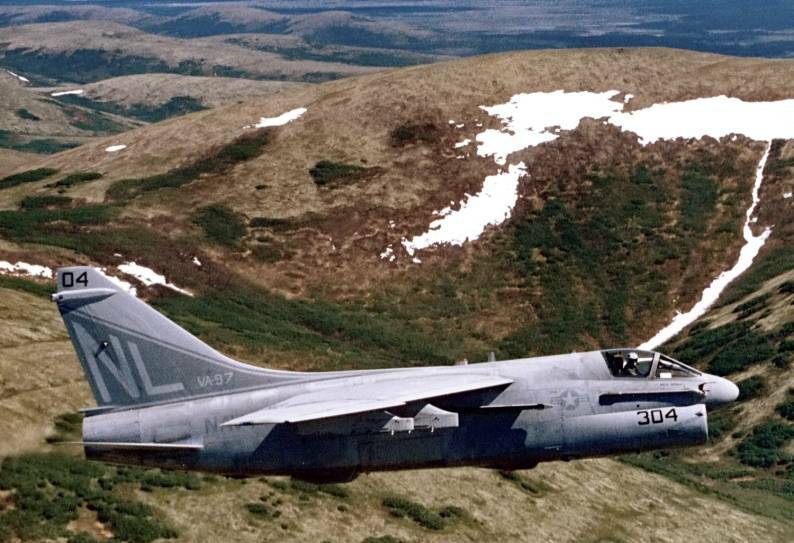 On 28 Jun 1968 the squadron conducted its first combat missions, flying the A-7 Corsair II, against targets in Vietnam. On 4 February 1971, the Warhawks embarked USS Enterprise (CVN-65) in Naval Station Norfolk, Virginia for her transit around South America to her new home port of Alameda, California. 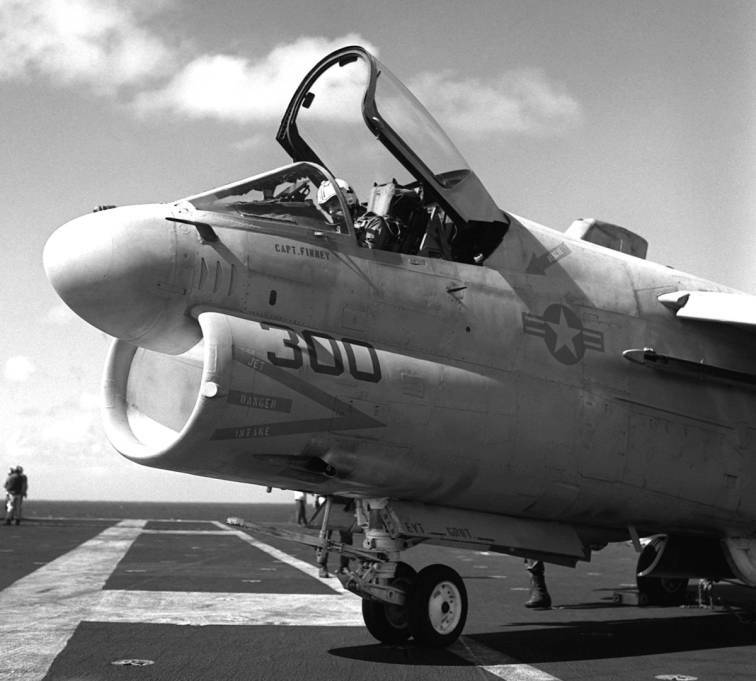 The squadron’s third deployment began in June 1971, embarked on Enterprise. In December of that year following the outbreak of war between India and Pakistan over East Pakistan (Bangladesh), Enterprise was ordered to leave Yankee Station for the Indian Ocean. The carrier, with VA-97 embarked, operated in the Bay of Bengal until the cessation of hostilities in the latter part of December. After returning to Alameda and a short turn-around period, the Warhawks again returned to WESTPAC in September 1972. There they participated in Linebacker I and Linebacker II operations in October and December, respectively. 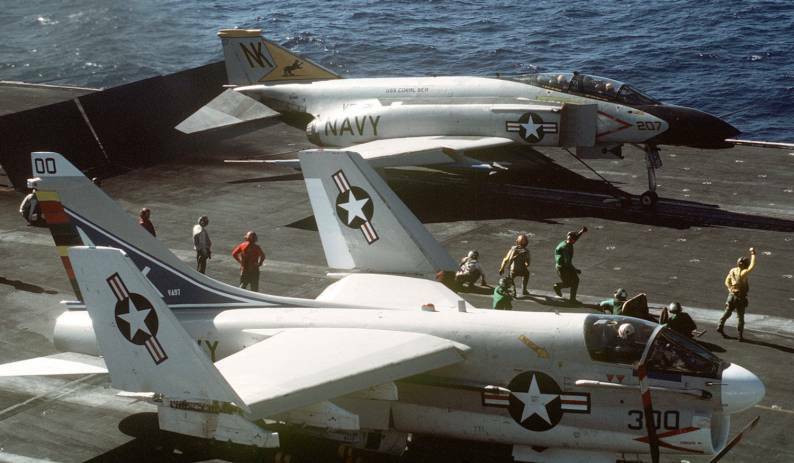 In April 1975, the squadron participated in Operation Frequent Wind and provided air support for the evacuation of personnel from Saigon as it fell to the communists. 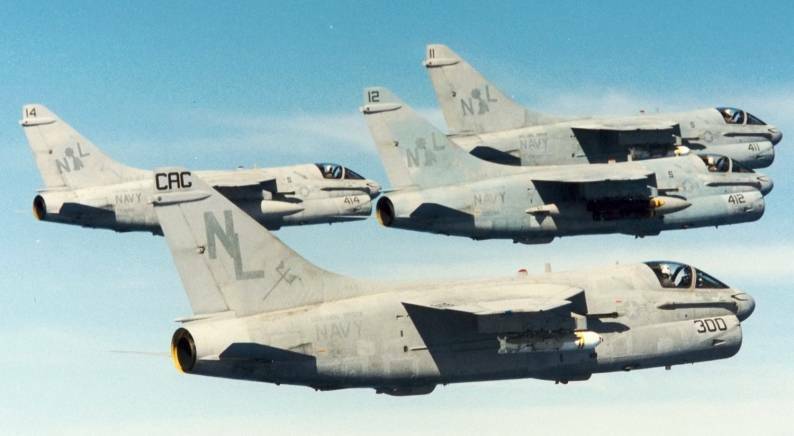 In March 1976, VA-97 achieved the "Triple Crown" of Naval Aviation awards, earning the Admiral Clarence Wade McClusky Award as the U.S. Navy’s top Attack Squadron, the CNO Aviation Safety Award (also known as the Safety “S”), and the Pacific Fleet Battle Efficiency Award (also known as the Battle "E"). Their seventh deployment began in April 1978 aboard Enterprise. The eighth deployment began in November 1979, embarked on USS Coral Sea (CV-43), with most of the deployment spent on “Gonzo Station” off the southern coast of Iran. 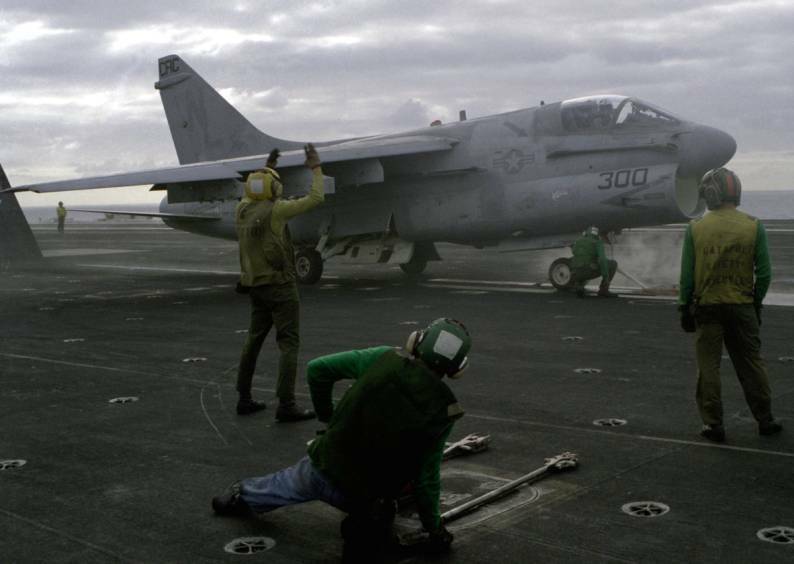 In April 1980 while embarked on USS Coral Sea (CV-43), the Warhawks were part of the task force involved in supporting Operation Eagle Claw, the Iranian hostage rescue attempt. 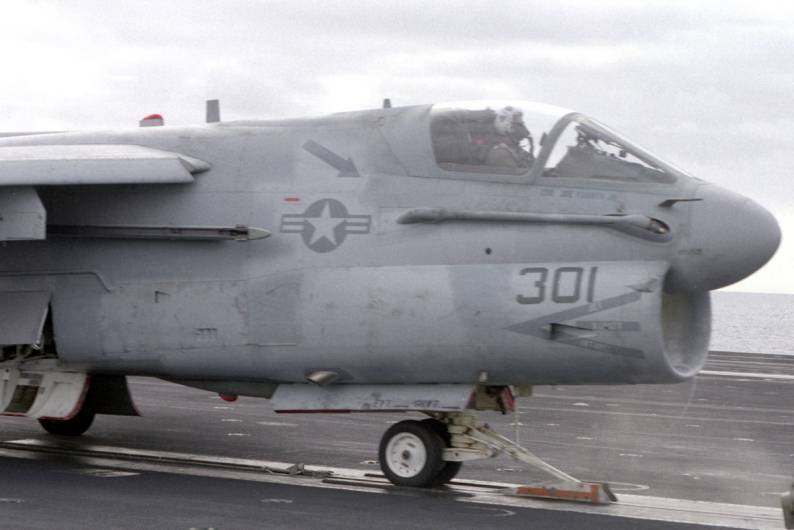 In August 1986, VA-97 participated in carrier tactical flight operations in the Bering Sea. In July 1988 during the Olympics in Seoul, Korea, USS Carl Vinson (CVN-70), with VA-97 embarked, operated off the coast of Korea. 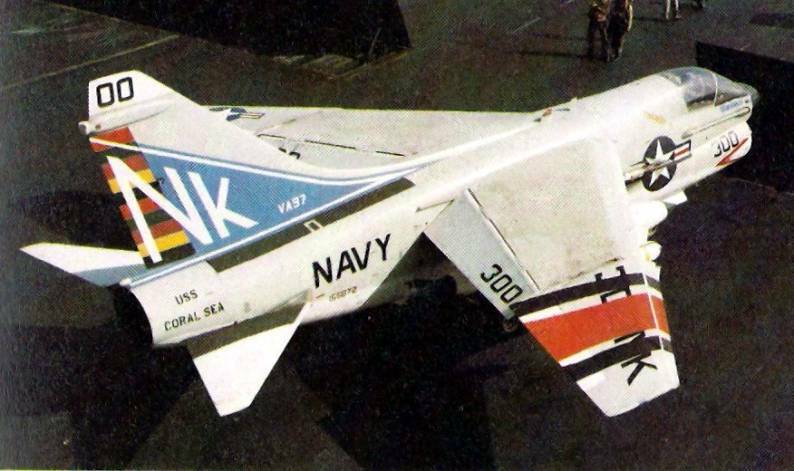 The Warhawks eleventh deployment departed NAS Alameda in October 1984 embarked in USS Carl Vinson (CVN-70), the U.S. Navy’s newest carrier. 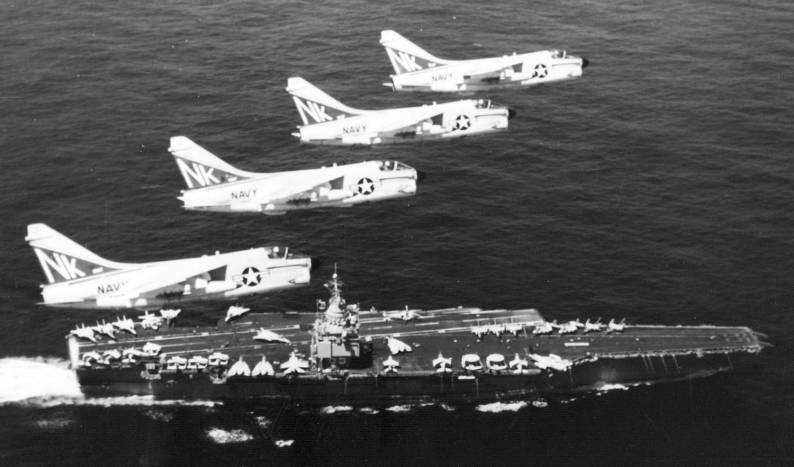 The Warhawks participated in FLEETEX 85, involving five carrier battle groups and sixty-five ships from various countries. 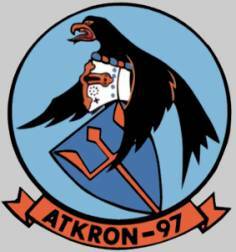 The 12th deployment began in August 1986 and added a number of new achievements to the long list. The Warhawks operated with Carl Vinson above the Aleutian Islands Chain in the Bering Sea, both on the way to WESTPAC and on the return trip. 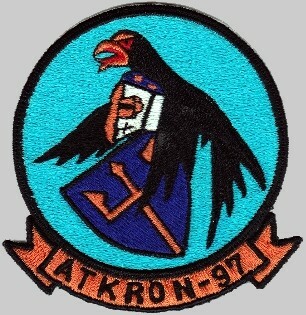 The squadron returned home in February 1987. 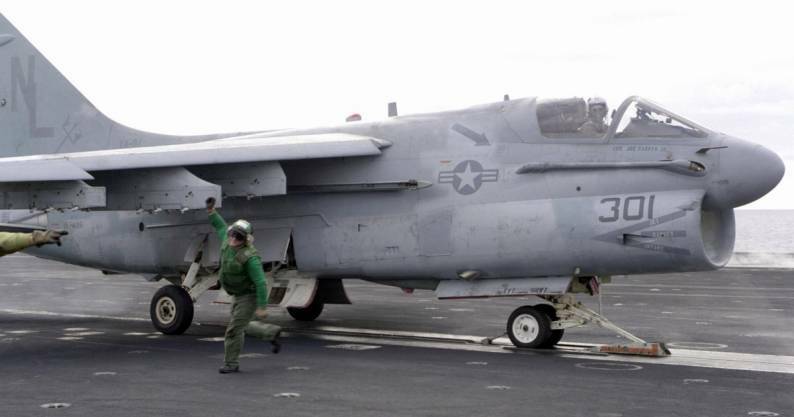 The 13th deployment began in June 1988 and included support of Operation Earnest Will convoys in the Gulf of Oman and the Straits of Hormuz, ending with the Warhawks winning the Battle Efficiency Award. 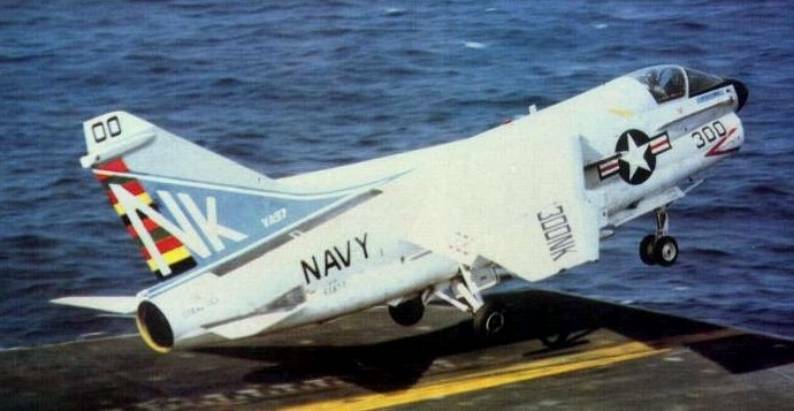 In 1989, the Warhawks earned the LTJG Bruce Carrier Memorial Award for Maintenance Excellence and the CNO Aviation Safety "S" award. Throughout the 1990s, the squadron supported United Nations coalition forces by participating in Operation Southern Watch in Iraq. They also flew in support of Operation Restore Hope in Somalia. 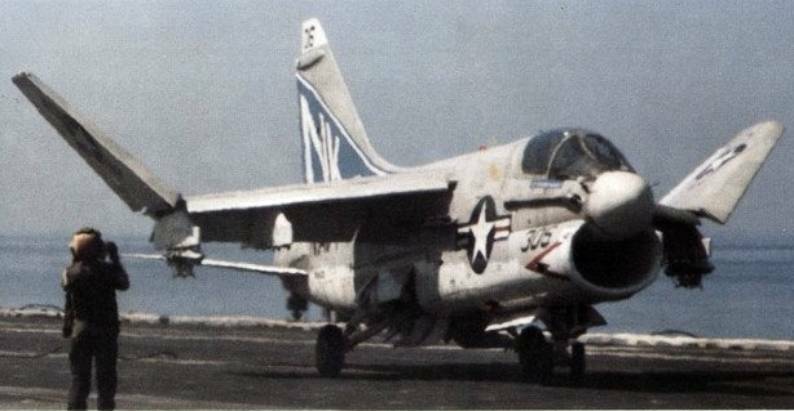 1990 was a notable year in WARHAWK history as they completed their 15th and last WESTPAC deployment in the A-7 Corsair. 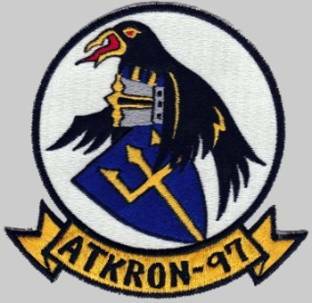 On 24 January 1991, VA-97 was redesignated Strike Fighter Squadron NINETY SEVEN (VFA-97) and transitioned to the FA-18 Hornet.